Like any genre, the Female Fronted fraternity has several names that are considered the big guns. One of these has to be Floor Jansen who fronted After Forever and then went on to form her own band ReVamp. They released their self titled debut in 2010 and since that record Jansen has been on the road temporarily fronting Nightwish. 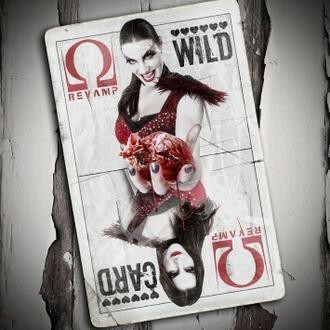 With that trip soon over, she and Revamp are back with their follow up 'Wild Card'. If you're looking for a relaxing listen, you best move on as this is pretty hostile stuff. As Jansen says, 'this became the most aggressive album I have ever made'. 'Wild Card' is an intense and heavy listening experience that borders on psychotic at times and it's a reflection of her publicised burnout. The opening two tracks symbolise this with 'The Anatomy Of A Nervous Breakdown - On The Sideline' and 'TAOANB - The Limbic System'. Both are filled with frantic guitar work and hefty progressions with Jansen's vocals as schizophrenic as the titled suggests, ranging from wailing soprano to clean rock to brutal growls. 'Sideline' has an infectious chorus that demands to be replayed while listeners will find 'Limbic' slightly more Symphonic but no less wild. 'TAOANB' resurfaces mid-album with the equally crazy duet 'Neurathenia' featuring Devin Townsend. This adds squealing synth with Jansen and Townsend in a clean vocal duet. ReVamp also veers into After Forever territory with 'I Can Become' and 'Misery No Crime'. That's especially true of 'Misery...' with its death grunting from Jansen's long term cohort Mark Jansen. '...Become' is a bit more varied with some fat techno bass and keyboard solo full of effects. A more traditional Symphonic Metal sound can be heard in 'Precibus', 'Nothing' and 'Distorted Lullabies'. My favourite though has to be the title track with its revolving riff and powerful vocals that build up to a piano filled, thundering chorus. What we have here is something that may be unusual, but it's certainly a bit special. Make no mistake this is not for those with a faint heart or those with a dislike of death growling. But for everyone else this is eleven tracks of expressive, powerful and diverse metal. 'Wild Card' is a reminder of why Jansen is one of the most astonishing vocalists around. I can't think of another who can deploy such a vocal range or has the ability and skill to match those displayed here. The swing from soprano to death grunting may not be to everyone's taste but that doesn't make it any less staggering. Everything else from the axe work to the production is of equal standard to the singing making this stellar album one I rate higher every time I listen to it. Just when I thought I'd seen it all this year, Jansen throws in her 'Wild Card' to make me think again.